Whether you need to maintain your health or attain peace, you would always come across different types of yoga. While every style is a bit different from others, variations would certainly enhance the yoga experience. In fact, the exercises would help you move out from the comfort zone. So, let’s have a look at the types of yoga. 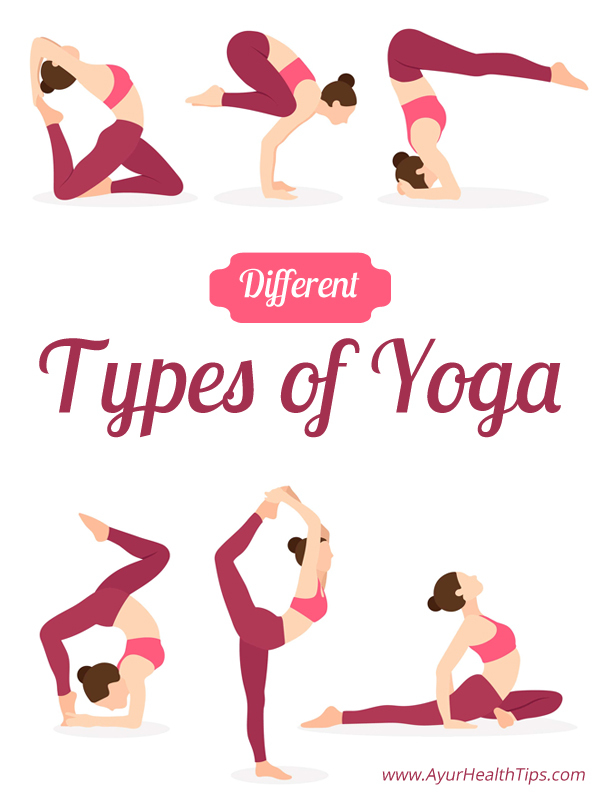 1 What are the Different Types of Yoga? In Sanskrit, the word, ‘Hatha’ denotes an umbrella pertaining to the physical postures. In the western regions, the yoga expert introduces variations like Ashtanga, Iyengar, etc.. However, such branches of yoga are far distinct from regular practice of postures. The classes that follow Hatha yoga are ideal for beginners. This is because it actually helps the individual with breathing exercises and other set of exercises. So, if you are new to yoga, then you should always opt for Hatha yoga. Whenever a class is conducted for Iyengar Yoga, then the students are able to control their breath along with a variety of postures. While the individual holds the poses for a long time span, props are used to go deep into the pose. This style is suitable for individuals with injuries and those who need to work with great care. Soon after the Iyengar class, the person actually goes through an incredible experience. If you wish to enhance physical and mental strength, then you should regularly practice Kundalini yoga. The style primarily focuses on releasing energy that’s around the lower spine. As the sessions are pretty intense, the individual focuses on the breathing exercises and chanting mantras. Asthanga literally means ‘eight limb path’ in Sanskrit. So, since a person has to go through a set of postures, the style is not appropriate for beginners. Usually, the Asthanga yoga commences with 10 sun salutations and the floor and standing postures. Moreover, Vinyasa yoga is yet another style that comes from the Asthanga Yoga. Vinyasa means ‘to position yourself in a certain way’. It was way back in the 1980s, when the Vinyasa Yoga was derived from the Asthanga Yoga. In the classes, the coordination with the movement is carried out by flowing from one pose to the other. In the modern era, the style is also known as the power yoga, and prana. While the entire batch of students goes through an alignment-based style, the body is toned through new poses with every session. The poses are practiced inside a dark room or with eyes closed and the candle lit in front. If you looking for losing fat through perspiration, then Bikram yoga is just for you. As the person goes through a sauna, the indoor space is set to a temperature as much as 105 degrees. With 26 basic postures, every pose is carried out twice. As the space is illuminated, the students have to maintain a position in front of the mirror. During the entire session, the yoga expert doesn’t play music. With seated postures for a longer period of time, Yin Yoga is nothing but a slow-paced style. The sessions are great for beginners as the positions can be held for 45 seconds to as much as two minutes. The individuals are also trained for meditative yoga that helps in attaining peace. Rather than straining the muscles, the person has to rely on gravity to get into the poses. Yin yoga helps in lengthening the connective tissues and complement Yang yoga. This means that if Yang is active and Yin is passive, then the muscles are relaxed under rest and gravity. As the name implies, restorative yoga focuses on getting off the load after a stressful day. While the set of exercises relaxes the mind, the style releases the strain from the body. A person may have to spend more time with a few postures. Just like Iyengar, many props are used during the yoga class. These include bolsters, blankets and eye pillows and enhance the experience like never before. As the poses offer a great way to alleviate stress, the yoga aids to think with a positive outlook. Prenatal yoga is meant for pregnant women and has been designed for all trimesters. According to doctors, the prenatal yoga is considered as the best type of exercise because it strengthens the pelvic and helps the person to focus on breathing. As time rolls by, the exercises help to develop a bond with the infant. Furthermore, prenatal yoga actually rules out the complications and prepares the woman for labor. In case you are looking for a modern version of Hatta yoga, then there’s nothing as better as Anusara Yoga. As you grow spiritually, you would be connecting the mind, body and the soul. The class always proceeds with the prime focus on Chakras and doing every step wholeheartedly. Introduced in 1984, Jivamukti yoga usually follows the style of Vinyasa yoga. A series of chants usually commences the classes. As far as the poses are concerned, they are carried out in line with five tenets of philosophy and yoga. While the person relaxes, he would always be in better position to connect with the forces around the earth. It is because of this reason Jivamukti devotees always keep the vegetarian philosophy in their minds. If you haven’t heard Sivananda yoga anytime before, then the set of exercises focus on proper breathing, diet, positive thinking and relaxation. When all the five principles work together, the person would be happy to lead a healthier lifestyle. When it comes to practicing the asana, the twelve basic poses move on with the Sun salutations and Shavasana. But, as compared to other asanas, the ambiance is silent and no music is played in the background. As the individual follows the yoga instructor carefully, he can reap many health benefits from the yoga. Practicing yoga regularly helps in reducing the cortisol level that the adrenal gland secretes. Soon after the relaxing the body, the tension around the muscles are substantially released. This nourishes the body with ample oxygen and fresh blood. The experience in turn helps to reduce stress and calm down the mind. Yoga helps to combat cancer and other painful conditions like multiple sclerosis and arthritis. This ultimately reduces the pain and inflammation due to the release of endorphins. The person can also gain relief if he has been suffering from a chronic condition and auto-immune diseases. After stretching the muscles from time to time, yoga enhances mobility and flexibility. This promotes faster recovery and prevents muscle cramp which is caused due to the accumulation of lactic acid. Since different types of yoga help in improving the functioning of lungs, the asanas aid in reducing asthma. The person would feel energetic and think with positive mind once the breathing techniques clear the chakras. Due to movements, yoga circulates the blood in addition to replenishing the cells in the body. The asana also decreases the heart rate boosts endurance and oxygen supply during a workout. So, if you are eager to join a yoga class, then you should seek joy with every step you perform. Remember to stay comfortable and adapt to every kind of yoga. Although the teacher may not encourage you to perform the asana, it’s always better to mix poses. This would totally depend on the body, the schedule and numerous aspects of life.